Columbia, MO — A tragedy unfolded last week in front of a school in which a Columbia police officer, Andria L. Heese, 27, drove her police SUV up onto a sidewalk and killed 4-year-old Gabriella Curry. 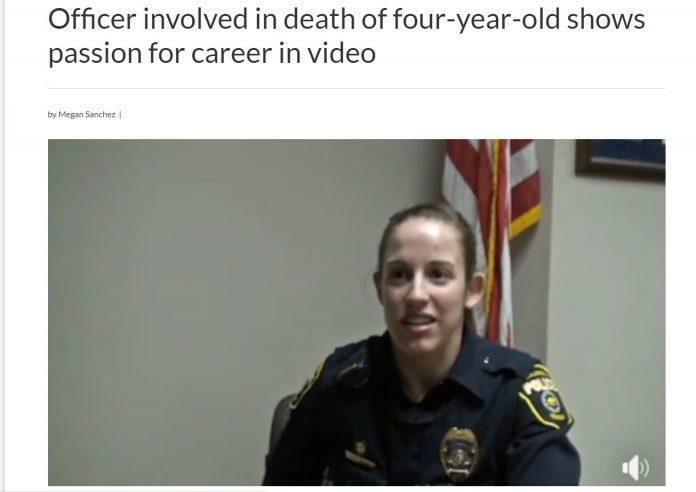 It is undoubtedly a terrible time for all parties involved—especially the parents—but local media took to praising the officer shortly after the incident. The tragedy unfolded Friday afternoon as Heese arrived at Battle High School to observe students departing school. As she arrived at the school, she drove her police SUV onto the sidewalk where little Gabriella was walking. Heese was driving in a roundabout near the parking lot at Battle High School in Columbia when her car “exited the left side of the roadway,” the crash report states. The SUV then struck Gabriella and she would not survive the trauma. Columbia city spokesman Steve Sapp said that emergency workers responded and rushed Gabriella to the hospital but she was too badly injured and did not survive. According to the Columbia Tribune, Curry was pronounced dead at MU Hospital, the patrol reported. She is the daughter of a couple who drive for Student Transportation of America and she was riding in the bus driven by one of her parents, Sapp said, explaining the preschooler’s presence at the high school. “For some reason, and we do not know the circumstances yet, at some point she exited the bus,” Sapp said. The question of why Gabriella got off the bus is irrelevant as she was still on the sidewalk and should have been considered safe from vehicles. Had a civilian driven their vehicle onto the sidewalk in a school zone and struck and killed a child, rest assured that they would’ve likely been arrested on the spot and facing criminal charges of vehicular manslaughter or involuntary manslaughter. Instead, Heese was placed on paid administrative leave. No one here is claiming that Heese doesn’t deserve due process. No one here is claiming that Heese is not innocent until proven guilty. And, no one here is claiming that she doesn’t feel horrible for what she’s done. But it is an undeniable fact that because of her actions and negligence, an innocent child is dead. Heese may not deserve to be lambasted by the media, however, she most assuredly should not be receiving praise. But this is exactly what’s happening in the story mentioned above and it illustrates a serious problem. All too often, when police officers shoot entirely innocent and unarmed people, the mainstream media will dig through that person’s past and try to find any and all dirt as to paint the victim in a negative light. We saw this reaction from media and politicians in the tragic case of Botham Jean who was shot and killed in his own home after officer Amber Guyger wrongfully entered his apartment. Instead of digging up Guyger’s past to review her use of force, the media and politicians shamelessly ran with the headline that Jean had a tiny bit of marijuana in his home as if this justifies being murdered in cold blood. The union and local media all praised Guyger for her dedication to the force and claimed she was an outstanding officer. Senator Ted Cruz even went so far as to urge the public not to blame Guyger for the tragic shooting, even though she admitted to pulling the trigger. This reaction from the political class and establishment media is a huge problem. Yes, there are a slew of great men and women who put on a uniform every day and risk their lives to protect people from abuse. But this does not grant all police officers some special privilege to commit horrid atrocities and get a pass. Sadly, this is what happens the majority of the time. While we don’t know the outcome of this specific case, if history is any indicator, we can predict that Heese will not face any consequences for her actions and will likely remain a police officer.